Since January, I’ve been writing 10 goals per month on the first Sunday of every month. 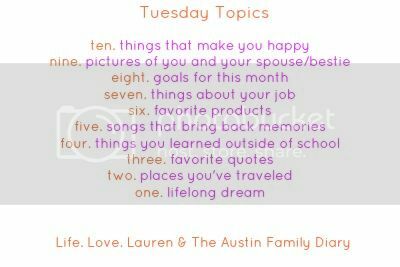 It was actually because of the Tuesday Topics series that I started doing this! Originally, the first Tuesday Topic was 10 New Year’s Resolutions. I ended up writing 10 goals, and from there I kept doing so every month. Therefore, I just listed 10 goals for this month on Sunday! I tend to break my goals down in my head into a few types – family goals, house goals, self goals, craft goals, and blog goals. This helps me come up with my monthly goals. I find it especially important to come up with goals that I know I’ll be able to fulfill. They may take the whole month, but this way I feel accomplished! Have some awesome family adventures. Have some great times with the kids. Fix up or organize something in the house. Improve myself or do something to make myself happy. Create a few great crafts. Write some awesome blog posts. And of course, complete something off of my 35 Things list. 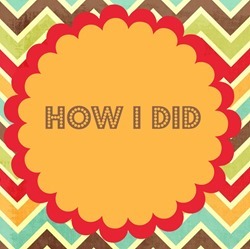 Blogging has helped me accomplish more things – when you are accountable you get things finished! It’s one of my favorite things about my blog. Do you come up with monthly goals?